Friday morning – an hour or two before sunrise – the moon will shine quite close to the heart star of the constellation Scorpius. Find the rather fat waning crescent moon in the south to southeastern sky. Then look for the nearby reddish star. If you can’t see the sanguine color of the Scorpion’s heart with the eye, try binoculars. That is Antares, the brightest star in Scorpius. This ruddy gem represents the Scorpion’s beating heart. Antares is not as red as a fire engine or a tomato. To me, it looks more like a faint ketchup-stain red. Antares is 16th brightest star in the night sky. A star this bright – and this close to the horizon – is bound to sparkle. Although you cannot see it, Antares has companion star, Antares B. This companion is blue in color. Can you imagine living on a planet that has a blue and a red sun? Speaking of red, the moon may have an orange tinge when you see it near the horizon. That is because – at such times – you are looking through a greater thickness of atmosphere than when the moon is higher in the sky. 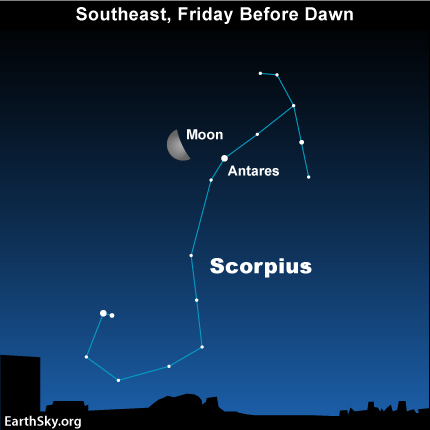 The moon and Antares – the Scorpion’s heart – will rise in the southeast a few hours after midnight tonight, then will swing into the southern sky by daybreak on Friday, February 25.